Hours before the start of the new school year, the Arab education system is entering a collision course with Education Minister Gideon Sa'ar. "In the five months since its establishment, the government and Education Ministry have announced a series of dangerous decisions, such as a ban on marking the Arab Palestinian people's Nakba at schools, the Hebraization of road signs, forcing students to sing 'Hatikva' (the national anthem) and encouraging military and national service as a criterion for rewarding schools and staff," according to Atef Moadi, director of the Follow-Up Committee on Higher Education. Moadi said Monday that the Committee "strongly rejects the decisions, and stresses that if any attempt is made to implement them in Arab schools, the response will be a refusal and a declaration of revolt." The Committee held a press conference in Nazareth ahead of the new school year, which begins Tuesday. The meeting was attended by Nazareth Mayor Ramez Jeraisy, chairman of the National Committee of Arab Local Council Heads, Hadash Chairman Knesset Member Mohammad Barakeh, a member of the Knesset's Education Committee, and Muin Armush, chairman of the National Association of Parents' Committees in the Arab Sector. It should be noted that the Higher Arab Monitoring Committee already announced, immediately after Sa'ar made his ideas public, that the Arabs would not adapt themselves and would continue to demand an autonomic administration for Arab education. The threat to revolt, however, is considered an escalation of the battle. The meeting attendees stressed that the bodies they represent "will continue to fight for the right of half a million Arab students to receive an education which honors their national and cultural uniqueness, and will continue to mark all the main historic events, such as Nakba Day, the Kfar Kassem massacre, Land Day, and the October 2000 events, as part of a plan for education of national identity." Also on the Committee's agenda was "national and civilian discrimination", calling for equal education based on a different narrative than the one acceptable today. "For more than 60 years, the policy of the Israeli governments and the education ministers has been characterized by the creation of ignorance and discrimination," Moadi said. "The Arab education system – in terms of the organizational structure, the educational policy and the human product – is still captured by the 'security' conception and a policy of blurring the Arab culture and the historic Palestinian narrative, and distorting the national and cultural affiliation of Arab students. "The system is still far from answering the minimal conditions for realizing the Arab Palestinian society's right for education in Israel, as people born in this country and as citizens of equal rights, according to international law and treaties, and in accordance with the wide consensus among the Arab public and its educational leadership." The Committee also complained about the serious lack in budgets directed to Arab education in Israel. "The policy of discrimination towards the Arab education perpetuates the backwardness and social-economic dependence of the Arab society," added Moadi. According to him, the accumulated deficiencies in material and human resources, alongside the failure to implement education laws, create a 20-30% difference between the achievements of Arab and Jewish students on all exams – including matriculation exams, international exams and the psychometric test, in which there is a gap of more than 100 points between Jews and Arabs. "The bottom line is that higher education is only accessible to one out of every four Arab high school graduates, compared to one out of every two Jewish graduates." Some 475,000 Arab students will study in Israel in the upcoming school year, constituting about 25% of all students in Israel, in 2,776 educational institutions (including the Druze and Bedouin sector). About 20% of Arab students study in kindergartens and daycare centers, 50% in elementary schools, 15% in junior high schools, and 15% in high schools. 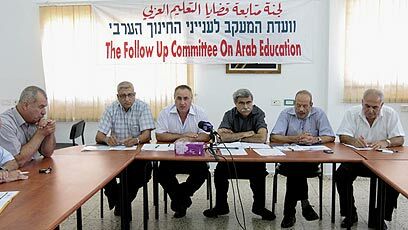 The Follow-Up Committee on Higher Education was established in 1984, as a public committee representing the entire Arab public in Israel in regards to Arab education. It operates alongside the Higher Arab Monitoring Committee and is sponsored by the National Committee of Arab Local Council Heads. The Committee's main goal is advancing Arab education and achieving equal rights on all levels. See all talkbacks "Arabs threaten revolt against education minister "